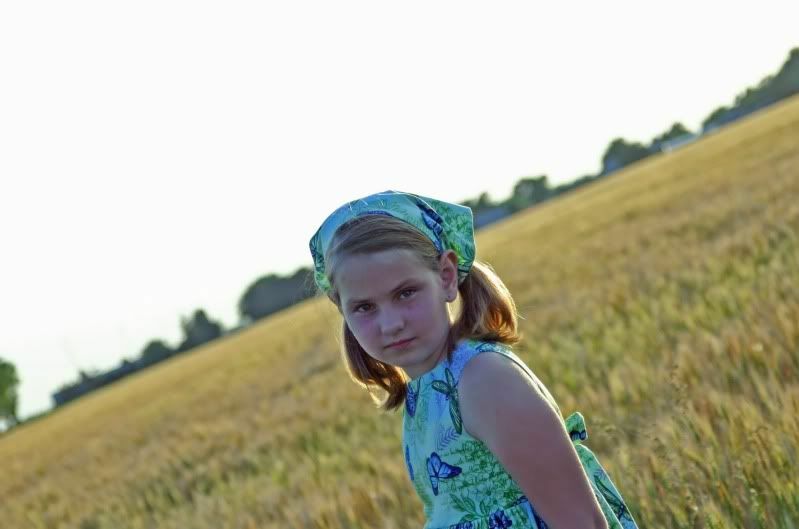 TheRustedChain - The Blog: Prarie girl. 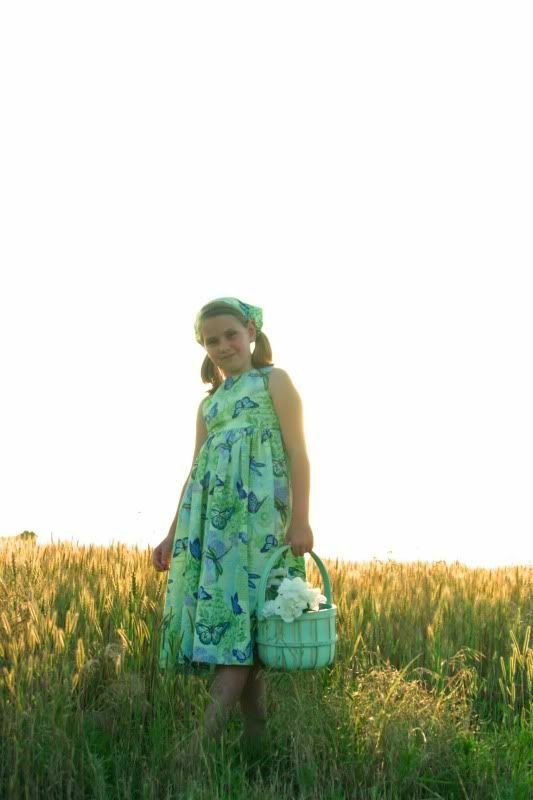 We got this dress the other day from Chigger Hill Cottage, and it was just begging to be photographed in a field. Her dresses are classic in every way. And I love that. I can't tell you how many people stopped us and commented on the dress just while we were shooting these. I think people are surprised to see pretty modest clothing. I heart sun glare. Big puffy sparkly heart it. The Baby stood behind me and threw rocks at me the entire time. Click here to join the hooked on party! Lovely pics! Love the model! Oh so adorable! I love the matching scarf. Really cute. Your daughter is beautiful--are those freckles? Sooo cute! What a beautiful girl and what beautiful pictures!! In order to make life complete, we all have to have at least one naughty one. The key is to admit it and move on! I can say this because I have a naughty 13 yr old son. Congrats. :) Your daughter looks beautiful. I wish mine would wear that dress!! 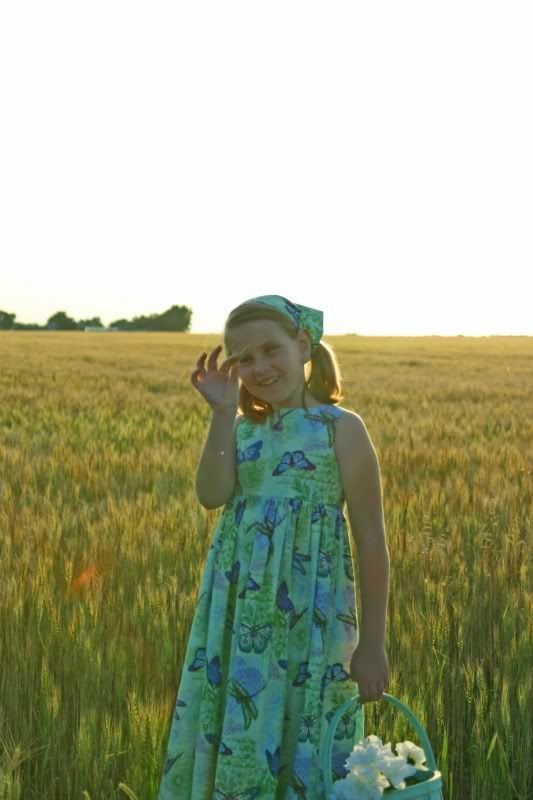 I love pictures with fields in the back ground, but more so the behind the scenes stuff you don't see. Hopefully the rocks weren't too big. Boy's just have to cause trouble don't they. And you gotta love that naughty boy. That is a lovely dress (and model!). I'm so sorry, but your naughty baby stories make me chuckle. I hope it helps you to write about it, because it sounds as if you say it with such affection in spite of the aggravation. Rocks? Ouch! Yes, everything I say about Bad Baby is said with affection. He drives me batty but is hysterical too! I'm constantly trying to put on my mean face to scold him, while holding back laughter. 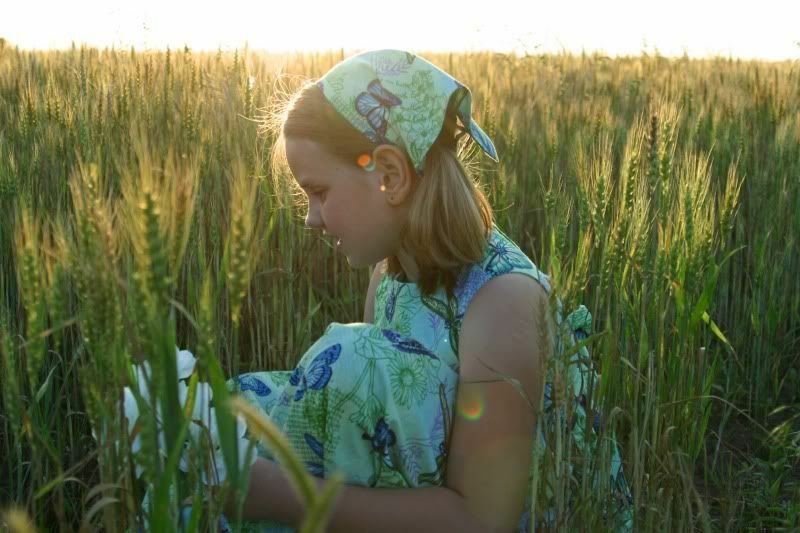 Love the photos, the dress, the field and the sunspots! Oh, also love the girl! Beautiful girl! Naughty baby! Love the photos, thanks for sharing them! Look at the twinkle in her eye! Great pictures! 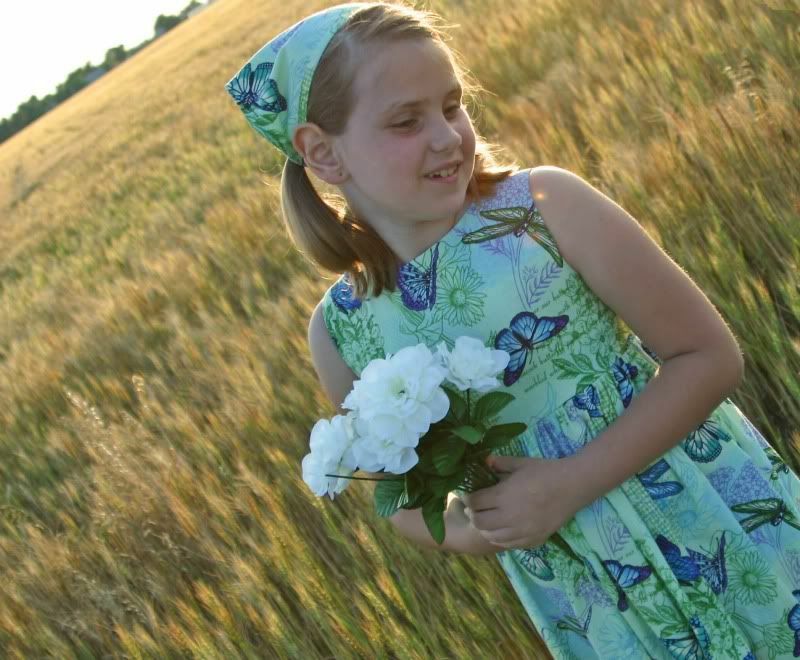 She looks like such a sweet girl, and if I had to guess, I would say she will be in 4th grade next year? 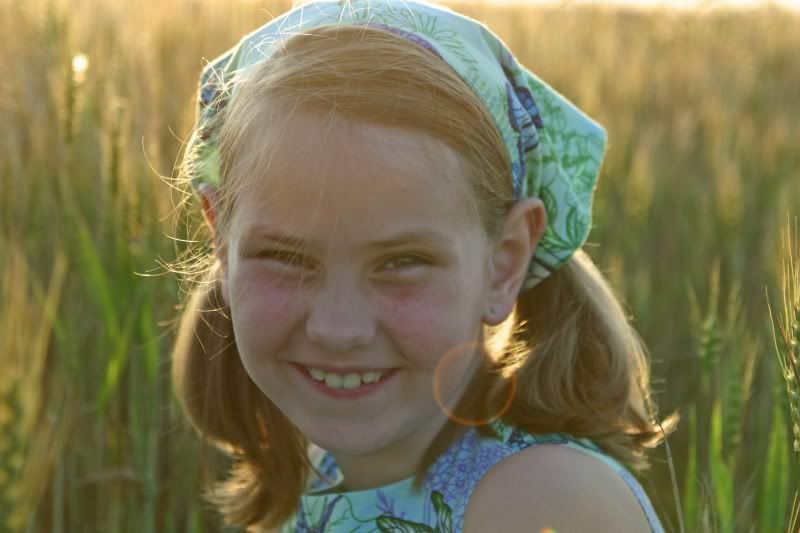 I always like to guess kids' ages based on their teeth - hers look like she lost those top teeth years ago. So pretty! She fits the dress perfectly.